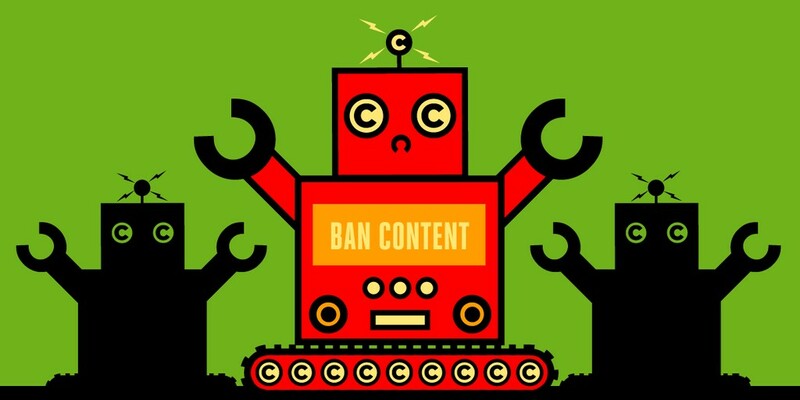 Under "Article 13," sites that allow the public to post anything that might be copyrighted -- text, pics, videos, games, sounds, code -- will have to run user submissions through a copyright filter that will check to see if it matches the a known copyrighted work. It's YouTube's perennially busted, overblocking Content ID, but for everything from Github to the copyrighted images on that band tee you wore in your Tinder profile. These black boxes will have the unaccountable power of life or death over everything Europeans say to each other online. They'll ingest everything we say to each other -- likely sending it to one of the giant American tech companies that specialise in this kind of filtering -- and render a judgment. Anyone can add to the blacklist, too: under Article 13, sites have to let people claim new copyrighted works -- but the rule has no penalties for abuse. Trolls can lay claim to every word ever posted to Wikipedia and stop anyone from quoting it on a WordPress site or Twitter or Facebook. If you get censored, your only recourse is to ask the site to reconsider its algorithmic judgment. If they won't listen or don't agree, you have to hire a lawyer to sue to get your free speech back. So far, this has flown under mainstream radar. A few right-wing sites like Breitbart have picked up on it, and well they should, because the conservative and eurosceptic parties are backing this proposal, even though it will make it vastly harder to start new sites where unpopular speech can be heard. It's one thing to pass the hat around to start a right-wing version of Twitter, it's another thing to cough up $60,000,000 to clone YouTube Content ID to comply with European law. But this affects all politics, and all movements. The whole point of this exercise is to make Google pay German newspapers royalties for linking to newspapers, and you can bet Google and Facebook and the other Big Tech companies will figure out how to comply with it. But as those companies increasingly block and filter speech at the behest of governments, the ability of #BlackLivesMatter or the movement to stop the new Heathrow runway will also have to come up with $60,000,000 if they get kicked off the big platforms for not colouring in the lines. If you're a European, here's a tool to tweet or call your MEP and tell them how you feel about this. Article 13 gets Wikipedia coming and going: not only does it create opportunities for unscrupulous or incompetent people to block the sharing of Wikipedia's content beyond its bounds, it could also require Wikipedia to filter submissions to the encyclopedia and its surrounding projects, like Wikimedia Commons. The drafters of Article 13 have tried to carve Wikipedia out of the rule, but thanks to sloppy drafting, they have failed: the exemption is limited to "noncommercial activity". Every file on Wikipedia is licensed for commercial use. Then there's the websites that Wikipedia relies on as references. The fragility and impermanence of links is already a serious problem for Wikipedia's crucial footnotes, but after Article 13 becomes law, any information hosted in the EU might disappear—and links to US mirrors might become infringing—at any moment thanks to an overzealous copyright bot. For these reasons and many more, the Wikimedia Foundation has taken a public position condemning Article 13. Speaking of references: the problems with the new copyright proposal don't stop there. Under Article 11, each member state will get to create a new copyright in news. If it passes, in order to link to a news website, you will either have to do so in a way that satisfies the limitations and exceptions of all 28 laws, or you will have to get a license. This is fundamentally incompatible with any sort of wiki (obviously), much less Wikipedia. It also means that the websites that Wikipedia relies on for its reference links may face licensing hurdles that would limit their ability to cite their own sources. In particular, news sites may seek to withhold linking licenses from critics who want to quote from them in order to analyze, correct and critique their articles, making it much harder for anyone else to figure out where the positions are in debates, especially years after the fact. This may not matter to people who only pay attention to news in the moment, but it's a blow to projects that seek to present and preserve long-term records of noteworthy controversies. And since every member state will get to make its own rules for quotation and linking, Wikipedia posts will have to satisfy a patchwork of contradictory rules, some of which are already so severe that they'd ban any items in a "Further Reading" list unless the article directly referenced or criticized them.